The Rage Circus Vs. The Soulless Void: Stay tuned for the "Irredeemable" blog tour kicking off with the Rage Circus! Stay tuned for the "Irredeemable" blog tour kicking off with the Rage Circus! 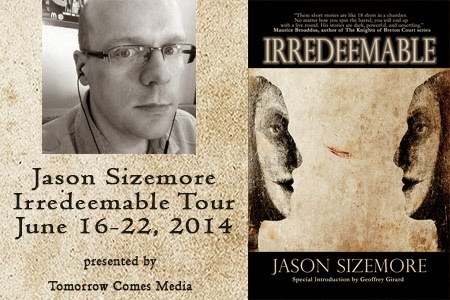 Coming Monday, June 16, the blog tour for Jason Sizemore's "Irredeemable" will kick off right here at The Rage Circus Vs. The Soulless Void Horror Blog! That's right Ragers, you will be the first on the blog tour to get some insight into this amazing book of short stories! "Flowing like mists and shadows throughthe Appalachian Mountains come 18 tales from the mind of Jason Sizemore. Weaving together elements of southern gothic, science fiction, fantasy, horror, the supernatural, and much more, this diverse collection of short stories brings you an array of characters who must face accountability, responsibility, and, more ominously, retribution. Whether the undead, aliens, ghosts, or killers of the yakuza, dangers of all kinds lurk within the darkness for those who dare tread upon its ground. Hop aboard and settle in, Irredeemable will take you on an unforgettable ride along a dark speculative fiction road." Check back in Monday for my full review and blog tour launch!